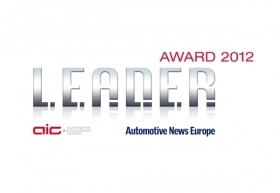 BMW, safety equipment supplier Autoliv and Renault are the 2012 winners of the third annual Automotive News Europe/Automotive Intelligence Center L.E.A.D.E.R. awards. L.E.A.D.E.R. stands for Leaders in European Automotive Development, Excellence, and Research. The awards recognize one top achievement for innovation in product development and environmental technology, supplier technology and retailing. BMW was chosen for its commitment to developing lightweight materials and technologies for future vehicles. An example is the carbon fiber-reinforced plastic (CFRP) passenger cell featured in the concept versions of its i3 electric car and i8 plug-in hybrid. Because of heavy use of carbon fiber, the electric-only range of the concept vehicles increases without sacrificing performance or compromising safety. Renault was chosen for the innovative retail strategy it has launched for its electric vehicle lineup. The French automaker is leasing the battery in its EVs to customers rather than selling it along with the car. Customers pay a fixed monthly amount for the battery. The move allows Renault to make the starting price of models such as the Kangoo ZE, Fluence ZE, and Twizy more competitive against vehicles with fuel-powered engines. Autoliv, the world's biggest maker of passive safety parts such as seat belts and airbags, was chosen for its positive financial results in 2011 and its strong moves to enhance its ability to offer so-called "active safety" systems that prevent accidents. The Swedish company's sales rose 15 percent last year to a record $8.23 billion while operating profit increased 2 percent to an all-time high of $889 million. In 2011, Autoliv also signed a license agreement for long-range radar technology, which allows it to offer adaptive cruise control in connection with emergency braking to autonomously slow a vehicle when an accident is imminent. Prior to the deal, Autoliv only offered short- and medium-range radar. Representatives from BMW, Renault and Autoliv will be honored June 21, 2012, during the Automotive News Europe Congress, held this year in Monte Carlo, Monaco.